Height and Weight – Which we will cover here. This is the second article in our series discussing build specifically. How Does Weight Affect Your Life Insurance Premium? Life insurance companies access your entire health picture, and any other risks, which is why they ask about your health history, medications, and even any hazardous activities such as travels, hobbies, or occupation. So it should come as no surprise that your build is also factored into the equation. 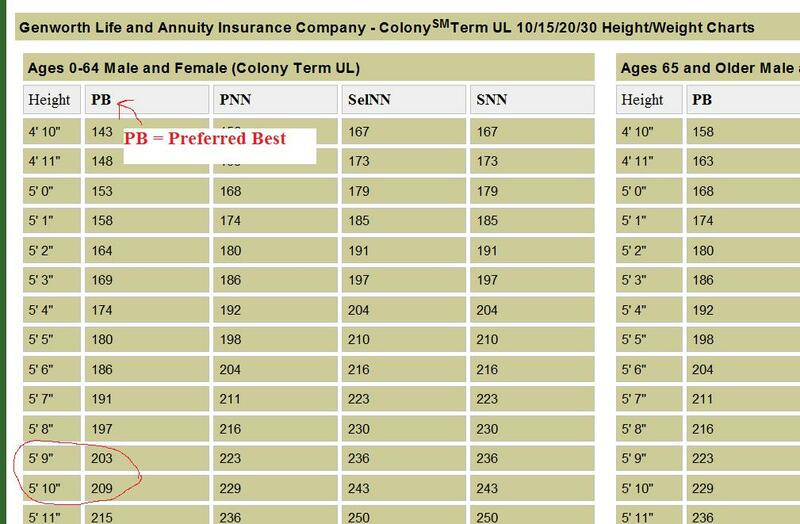 If you’re not diabetic, but are a bit on the heavy side, for example 5’10, 240, you could qualify for a Standard rating. Standard is a rating reserved for people with “average” life expectancies. What Happens When We Add Diabetes to a Big Build? What’s very interesting is that when an applicant has diabetes (let’s say type II), with no other medical conditions, the usual health approval is rated at Standard. Neither being overweight at 5’10, 240 lbs or having diabetes 2 by itself is a terribly bad life shortening risk. But what happens when you combine the two is you get a two headed monster. The insurance underwriters may look at a combination of diabetes and big build, and may drop your case from Standard to a mild sub-standard approval, which may cost 50% to 100% more than the Standard rate, depending on your height and weight. The build chart above is for illustrative purposes, and provides the max weights for only one of our carriers. Your premium will depend on your specific circumstance, your exact height and weight, and especially how well controlled your diabetes is. The only real way to know how much you’ll pay is to speak to a knowledgeable agent by calling 877-996-9383 and applying for a medical approval. Agents can “quote” you rates all day long, but they don’t know. No one knows how much it will actually cost until you apply for coverage, do a medical exam, and let them see your medical records. To get a term or whole life insurance quote with diabetes, simply fill out our Instant Quote form or call us at 877-996-9383.